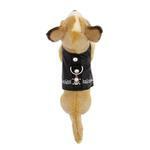 Show off your dog's bad-boy side with the Biker Vest Dog Harness by Doggles! Ideal for the little dog that has a large "bad to the bone" attitude! The black "leather" look gives this dog harness a dangerously cool look, along with the embroidered barbed wire "tattoo" and metal skull charm. 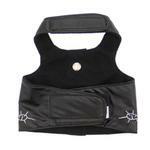 This pet harness biker vest is easy to care for with its wipe-clean faux leather. The skull and crossbones charm adds some "heavy metal" detail to enhance the barbed-wire embroidery. Biker Vest Dog Harness by Doggles Customer Photos - Send us your photo! Angel is one COOL DUDE! Ava wears this for bike night in downtown Fort Myers, Florida. These vests fit perfectly. My furkids luv to go out & about town, they recieve a lot of attention from people. They are sweet pups. Love riding with daddy on his dirtbike while rocking my biker harness! 12 week old Pepper loves to hit the road on our Harley sporting her biker vest and goggles and she loves all the attention she gets when we make stops!! Scoobs the Dude in his new bikers vest! I'm Spartacus warrior and lil lover. Posted On 07/13/17 by Kelly Washburn from Riverside, CA Yes, Kelly Washburn recommends this product! Great quality and very cool looking! Posted On 05/23/17 by Kelly D from Des Moines, WA Yes, Kelly D recommends this product! This is really cute, but my Baxter managed to get out of it and run away, I had a panic attack. From now on it will only be used for pictures. I'm not sure how he got out of it but Mr escape artist needs a more secure harness!! Posted On 11/03/16 by Monique L from , Yes, Monique L recommends this product! For the bad boy in your pack, just fun! Posted On 05/27/16 by Trudy H from , NC Yes, Trudy H recommends this product! Sam looks adorable in his teacup size vest!! We get stopped wherever we go,and folks always ask where I bought it, so I give them your online address, and see them writing it down,too! In ordering this I ordered according to size chart but it is a little big on him but I love it and also ordered one for his Rose which is way to big for her. I was told to order a size up due to her being 6 mos. so I am hoping she will grow into it. Posted On 02/10/16 by Kathleen B from Denison, TX Yes, Kathleen B recommends this product! I purchased this for my 4 lb, Yorkie, Cabo. Backs up his inner "big dog' personality. Nice detail. Great price! Posted On 10/29/15 by Maribeth H from New Port Richey, FL Yes, Maribeth H recommends this product! Love this vest and it fits my dog perfectly. Absolutely love this and the fit was perfect for my little Yorkie! Thank you he looks awesome!! Posted On 07/23/15 by Diane J from Hillsborough, NJ Yes, Diane J recommends this product! Jack will be the best dressed male dog in the County and will make many kids and seniors smile ear to ear when he appears in his biker harness, his biker hat, goggles, Chevron collar. Because of his shape, regular shirts don't fit him right so this harness is perfect. And I can attach his leash to it too. He will be the hit of the town. Every year the trick or treaters come to the door and want to see what the pups are wearing. They holler for their parents to come and take a picture. Posted On 06/08/15 by Victoria K from Easton, WA Yes, Victoria K recommends this product! Lil man will be wearing this to Sturgis! Look out ladies ! Posted On 04/08/15 by Victoria K from Easton, WA Yes, Victoria K recommends this product! My dog loves his new vest and doggles can't wait to go on a ride on our RTV in style. Thanks for the speedy delivery and the nice candy cane treat for my dog Moose, he loved it, sat by the fire and chewed his little heart out. Merry Christmas Baxter Boo! Posted On 01/03/14 by Linda L from , CA Yes, Linda L recommends this product! Very soft material and fits well. My little long-haired doxie/chihuahua mix already has attitude and this harness is perfect for him. Love the dog items. Big selection. Only had small problem getting back to an item I saw. Probably my fault as I am not expert on computer.